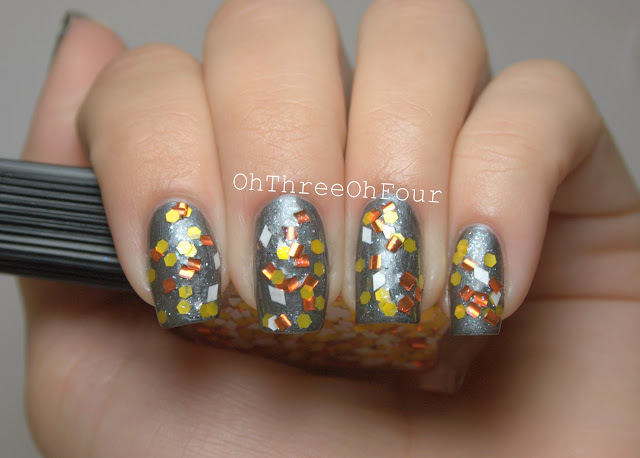 Lynnderella Children Of The Candy Corn contains opaque white diamonds, assorted yellow shapes and large orange squares in a shimmering clear base. All fingers are 1 coat of Children Of The Candy Corn over 2 coats of Orly Steel Your Heart (post here). All have a base coat of Seche Clear and a top coat of Seche Vite. 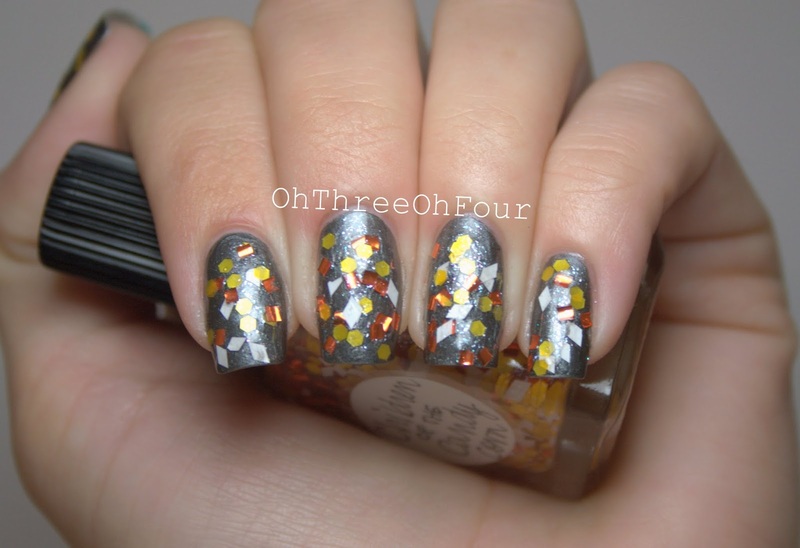 For this manicure, I used 1 coat of Children Of The Candy Corn over 3 coats of Cosmetic Arts Gray (post here) on all fingers. The same top and base coat was used on this manicure as the other. I will leave it up to everyone to choose their favorite or if there is any other color you think this would look better over let me know in the comments. :) I did try it over OPI Hi Pumpkin! but the orange glitters didn't pop like I wanted them too. Lynnderella is currently only selling through her eBay store, which can be found here. Orly Steel Your Heart comes from Orly's Cool Romance Collection released in the Spring of 2012. I picked up my bottle in the clearance section at Sally's but, I have seen it at Ulta in stores and online still. Like Orly on Facebook here. Cosmetic Arts polish can be found at Ross stores for $1.99. I've also seen them on eBay if you don't have a Ross store nearby.